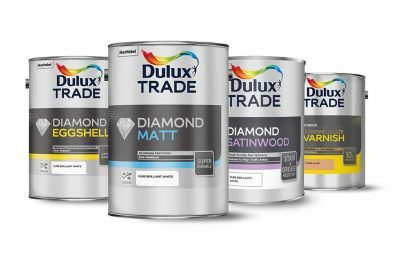 Dulux Trade has launched Diamond Satinwood a new water-based coating designed to allow decorators to switch to a water-based product that will match the performance of their existing Diamond range. Diamond Satinwood can be applied on woodwork and trims and is scuff, scrub and stain resistant while offering good durability against stains, grease marks and day-to-day knocks. The Dulux Trade Quick Dry range has also been given a makeover, with the packaging redesigned to make it easier for painters and decorators to identify water-based alternatives on shelf. Both the Quick Dry range and the Diamond Satinwood formulas dry twice as fast as solvent based paints. The formulation is recoatable in just six hours. According to Dulux Trade’s market data, there was a 13 per cent increase in water based sales from 2017 vs 2016, compared to a seven per cent decrease in the purchase of traditional solvent based paints, highlighting the growth in search for innovative, high quality decorating solutions. This emphasises the growing appetite amongst painters and decorators for more efficient options, whilst maintaining the same high quality, long-lasting finish as traditional methods.